If you’re in the process of adopting a child internationally or you’re the parent of a child who was adopted internationally, then this three part series is for you. Joining me is Bríd Mc Andrew: a speech and language therapist who has carried out research with parents of toddlers who were adopted internationally. In this first post, we’re going to look at language development in children who are internationally adopted so you can have a sense of what to expect. Patterns of international adoption have changed with the overall numbers of inter-country adoptions declining over the years. And now the age at which children are being adopted tends to be older. This means that they will have spent more time in orphanages or foster homes before coming home. (Approximately 88% of children who were adopted internationally have spent time in institutional care). Adoption can help to overcome the early adverse effects of orphanage care as children get used to their new, enriched environment. And children who are internationally adopted show a remarkable resilience when it comes to language development. The research talks about ‘a spectacularly rapid acquisition’ of their new home language, for most children. When your child comes home they experience a period of rapid change. They’re now exposed to new people, new climate, new home, new routine, new food etc. As well as this, they’re exposed to a new language: the language of the home which is usually not their mother tongue. So they have been exposed to their mother tongue up until they come home and then their exposure to the home language stops abruptly. It’s replaced with exposure to the new language. (This is called a second first language. Your child is learning a first language for the second time). This is a unique language learning situation. Before they have fully learned their mother tongue, exposure to it is stopped and then it’s replaced with a new language. And they tend to lose their mother tongue quite quickly due to lack of exposure in their new home. Children are wired to communicate and acquire language so it makes sense that this would happen. The purpose of language in early childhood is to form connections with loved ones and to communicate your needs. And at the same time as your child is getting used to their new environment and learning the new language, they’re also engaged in forming an attachment with you. Language and communication play an important role in the development of this attachment. The way in which you respond to your child’s bids for interaction (either verbal or nonverbal) can influence your child’s feelings of security in his/her environment. Being a tuned in communicator, using both words and nonverbal communication like facial expression and gestures, help form your attachment with your child. (We’ll show you how to do this in the last post in the series.) People’s experiences vary. 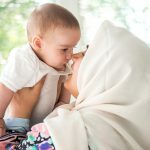 Some parents have found it easy to form an attachment while others have found it more difficult when they don’t share a common language with their child in the early period after their child comes home. Overall, children who are internationally adopted present with great variability in their language outcomes. As a group, they seem to have a higher likelihood for language problems when compared with their non-adopted peers. There is a lot of variability in language outcomes during the toddler and pre-school years but language skills are still within the normal range compared to children who were not adopted internationally. They tend to do well language-wise up until about age 4. There tends to be slightly less variation in language skills during the school age years and into adulthood. School-aged children had slightly to moderately poorer language skills compared with children who were not adopted internationally. School-aged children tend to perform more poorly on standardised tests that compare their performance to a set of norms than they do on other measures such as checklists and parent reports. Language outcomes were slightly better for children who were adopted at under 12 months. Within a few years post-adoption children’s language skills are in line with their non-adopted peers. For example, Glennen (2015) found that children adopted at ages 1 and 2 reached expected language abilities for their age within 15 months of adoption. Children adopted at age 3 reached age-level expectations after 2 years of exposure to their new language, and children adopted at age 4 met expectations after 3 years of exposure. But later in life as the language demands in school increase, the language skills of children who are adopted internationally can fall behind their peers. This means that it is important to keep an eye on your child’s language development especially as they progress through school. This may be particularly important if your child tested in the low average range for language development when they were a toddler as they may be at a particular risk for language problems when they start school. Essentially it shows that children who are internationally adopted make significant gains in acquiring their new home language in spite of their early experiences in orphanages or baby homes. (Many of the studies look at English). Although orphanages are not ideal places for child rearing, and children may not receive enough tuned-in interaction to acquire well- developed language, these effects can be over come when they come home. Generally, the research shows that by 4 years after coming home, most children who were adopted internationally score within the normal range on standardised tests of languages or checklists that parents complete. (This is compared with children who are learning language from their biological parents). Children who are adopted internationally tend to go through vocabulary growth spurts just like children who are not adopted internationally. Language comprehension or understanding of language tends to reach age-expected levels of development more quickly than expressive language (words, sentences, and grammar). The research is confusing because each study asks different questions, uses different methods to measure different things, and involves small number of children who have widely varying pre-adoption experiences and has varying findings. And countries differ in terms of the quality of institutional care and their economies. Both of which can affect outcomes. For example, there is research showing that children adopted from South Korea and China tend to have better outcomes than children adopted from countries in Eastern Europe and Latin America. And children raised in foster homes tend to have better outcomes than children raised in orphanages. So one source says that it’s important to remember that there is a subgroup of children who are adopted internationally who have significant language delays or difficulties. This subgroup is larger than what you find in the general population of non-internationally adopted children. And another study found that three years after adoption, that the percentage of children with language or speech delays matched estimates for what you’d expect in the general population of children being raised by biological parents. And there is still a lot more research to be done to really understand language development for these children. When most children are brought home, they may have language delays, but they quickly make gains due to increased exposure to the new language and more opportunities to put their language to good use in conversations and through play. Of course, children’s language abilities will vary and more research needs to be done to understand their language development better. But the good news is that the majority of children who are internationally adopted, when given enough exposure and meaningful communication opportunities in the new home language, make remarkable language progress especially in their first year home. For children who are adopted before age 2, the language transition is smooth with most children eventually developing speech and language skills that are average for their age. And rapid gains are made in the first two years after they come home. Older children may take longer to catch up as they have more catching up to do. But there are lots of gaps in the research. However, there are some children who will experience speech and language difficulties and may require intervention and support. In general, children who were adopted internationally at an older age are at a greater risk for a range of difficulties. (Older meaning after 12 months of age) Although older children may have more advanced cognitive development, they also have more ‘catching up’ to do in terms of language acquisition in order to reach the same level as their peers. Children adopted at older ages may be at an increased risk of speech and language delays, due to spending longer in institutional care. But again, the research is not conclusive that this the case in general. And some studies have found that three years after adoption, age of adoption did not influence children’s performance on speech and language measures. Most of the research tends to focus on children adopted before age 2. The bottom line is that children who are adopted internationally, need time to develop their new language. And most of the children do well when it comes to language development. It’s important to pay close attention when they start school as they may start to experience language problems as the language demands of school increase. In the next post, we will focus on the questions you can ask before you go to bring your child home so that you can get a sense of their early experience and their current language ability in their in their first language. Are you the parent of a child who was adopted internationally? We’d love to hear your story so be sure and leave a comment below. If you like this post, please pass it on to your friends! And if you haven’t already, be sure and sign up to get the next two posts in the series. Glennen, S. L. 2007. Predicting language outcomes for internationally adopted children. Journal of Speech, Language, and Hearing Research, 50, 529-548. Glennen S., (2007). International adoption: speech and language mythbusters. Perspectives on Communication Disorders and Sciences in Culturally and Linguistically Diverse Populations, October 2007, Vol. 14, 3-8. Glennen S., (2015). Internationally Adopted Children in the Early School Years: Relative Strengths and Weaknesses in Language Abilities. Language, Speech and Hearing Services in Schools 46: 1-13. Julian, M. M. (2013). Age at adoption from institutional care as a window into the lasting effects of early experiences. Clinical Child and Family Psychology Review, 16, 101-145. Rakhlin, N., Hein, S., Doyle, N., Hart, L., Macomber, D., Ruchkin, V., Tan, & Grigorenko, E. L. (2015). Language development of internationally adopted children: Adverse early experiences outweigh the age of acquisition effect. Journal of Communication Disorders, 57, 66-80. Scott, K. A., Roberts, J. A. & Glennen, S. (2011). How well do children who are internationally adopted acquire language? A meta-analysis. Journal of Speech, Language, and Hearing Research, 54, 1153-1169.